Ronald Wilson Reagan High School was built in 2005 in Pfafftown, NC. The orchestra is under the direction of Mr. Kenneth Tysor and consists of two sections of String Orchestra. Wind and percussion players, based on all-county band and western-regional orchestra audition results, are added in with the string players to form a full-symphony orchestra that performs twice two concert cycles. Our philosophy of music education is that we must create strong musicians before we can expect a strong music ensemble. The Reagan Orchestra program places its emphasis on independent learning, private lessons, master-classes by professional musicians, solos, small chamber groups, auditions, and honors orchestras. Orchestral ensembles present four concert programs a year, alternating string orchestras and full orchestra concerts. We perform repertoire representing different styles, genres, time periods, and cultures. From baroque to pop, classical to swing, and from full symphonic orchestra to small chamber groups, students receive a well-rounded music education. 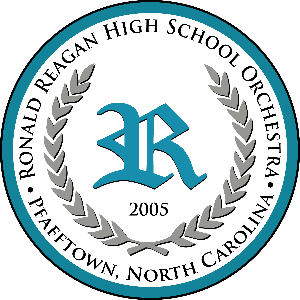 Orchestra students from Reagan HS are consistently well represented in Solo and Ensemble Festival, and All-County, Western Regional, and All-State Honors Orchestra. Mr. Tysor is the Director of Orchestral Activities and Associate Director of Bands for Reagan High School. Groups under his direction received superior ratings and have consistently seen substantial growth in both quality and quantity. During his tenure teaching in North Carolina, Mr. Tysor has chartered partnerships with local universities, established vibrant small-ensemble programs, utilized peer-tutoring strategies, coordinated high school mentorship programs, and seen dramatic increases in the number and quality of students selected for honor bands and orchestras. Mr. Tysor received a Bachelor of Music degree in Music Education from UNC Greensboro and a Master of Music degree in Music Education from Appalachian State University, While at ASU, he was the primary conductor of the Concert Band and the Graduate Conducting Assistant for the Wind Ensemble, Marching Band, Basketball Band and conducting classes. Primarily a clarinetist, Mr. Tysor established himself as a performer on a variety of instruments and genres as early as 7th-grade, when he was selected for the Charlotte Junior Youth Symphony Orchestra. Mr. Tysor performed as principal clarinetist of the Philharmonia of Greensboro and was also a member of the Wilmington Symphony Orchestra. In college, Mr. Tysor performed in principal positions in the Wind Ensemble, Symphony Orchestra, and Jazz Band. As a former member of the N.C. All-State Band and All-State Orchestra, Mr. Tysor sees the value in preparing for honor band, honors orchestra, and youth symphony auditions. Mr. Tysor has repeatedly coached students who were selected for principal positions in the N.C. All-State Band and All-State Orchestra. Mr. Tysor is a recipient of the John Philip Sousa Award and the National School Orchestra award. During the summers, Mr. Tysor frequently serves as a conductor for the UNCG Summer Music Camp, writes marching drill for high school marching bands, and is in demand as a clinician. Mr. Tysor, an avid sailor, also holds a limited captains license from the US Coast Guard, and can be found cruising and sailing his sailboat "Alibi."